There wasn´t a decent UC thread to be found around the Rewind so i made a new one. I don´t know, maybe it tells something. This is not among my favorite John hughes films but despite that it does include lots of good jokes and dialogue. John Candy is of course on fire here and i also like Gaby Hoffman and Macaulay Culkin. Great chemistry between these three. What i don´t like that much are the parents Elaine Bromka/Garrett M. Brown and the family teen Tia played by Jean Louisa Kelly. The acting just looks too "forced" IMO. Hughes loaned some from his Mr. Mom script (the crazy washing machine, sexhungry neighbor) and also got the idea for Home Alone during one of the Culkin scenes. If you like John Candy you have to see this one but i still think that it´s far away from masterpices like Ferris and Planes, Trains & Automobiles. What i didn´t know is that there was Uncle Buck tv show back in 1990 and another one in 2016 with African-American cast. Anyone seen these? Any thoughts about the film? I consider it the strong middle jewel of the Hughes-Candy trilogy, not quite as good as PT&A but a definitive step above The Great Outdoors. It's no surprise many fans consider Buck Russell one of Candy's very best characters, as he's both hilarious and inflective in the role, taking what could have been a one dimensional character and making him something special. You just have to love Buck even when he's slacking off or doing something considered outside of normal mores. From today's perspective, I love that Hughes took a more positive take towards a family moving; in today's cinema, it's standard practice for all the children to be furious at the move and refuse to budge from this viewpoint until the parents cave in with a genuine apology, and we're supposed to be in their corner no matter how cold-hearted they are. But Hughes in his prime was too smart for that, and it's refreshing to see Miles and Maizy willing to give life in Shermer, no matter how rocky at first, a fair try, and while we do sympathize with how Tia's feeling, we still acknowledge she's very much wrong. The soundtrack may not be the best in a Hughesian production, but it's surprisingly solid overall; Hugh Harris's Rhythm of Life is one of my favorite underrated movie themes. I never saw either series, and have no intention to: Candy is the one and only true Buck Russell no matter executives might think. Now the original might have been saved if the team behind it had decide to take a Statler and Waldorf style approach to it: have bookends and maybe a midshow segment featuring the movie cast watching the show and commenting on it (a minute or so each, so no major pressure on anyone's schedules in theory), therefore admitting it's a spinoff they're putting on and using the best incarnations of the characters for context. Caught Uncle Buck two nights ago just as it was starting on one of the movie channels. I usually watch this movie once a year but enjoyed catching it randomly on TV. Such a great flick. I really love John Candy in this role and honestly in almost any role. He's so likable, even when he's screwing up. I had several laugh out loud moments while watching Buck, which is hard to do when you know a movie so well. Not her wart, I'm the wart, she's my tumor. I love that scene. It still kills me. It's funny how times change, I remember this being a wonderful family movie. 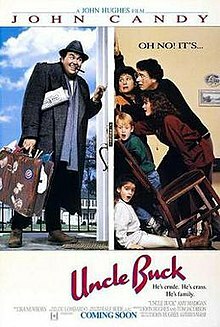 Put it on for my kids a few years ago when they were about 9 and 12 and found out that my Uncle Buck has quite the potty mouth. Lol. Not a big deal for me but I literally didn't remember it being so incredibly sweary. Things have definitely changed in what we view as a 'family movie' nowadays compared to what we used to watch 'back in the day'. Vlahakisa - totally agree! I'm always surprised by some of the stuff that was in movies that I watched as a kid. Pretty funny. "You know that ain't no sh*t we'll be getting lotsa t*t in Greased Lightning!" Never ceases to amaze me how much sexuality there was in 'family' movies before the Reagan era 80's really took hold. Grease is the ultimate example.